We normally have “flashback” posts on Saturdays, but as it’s a public holiday here’s another treat from the archives. This post by Peter Nunns was published in December 2014. Auckland is too congested to function – in fact, average commute times are a cruisy 25 minutes, well below many overseas cities. A while back someone sent me an article by geographer Phil McDermott that really hits the trifecta of fallacies. 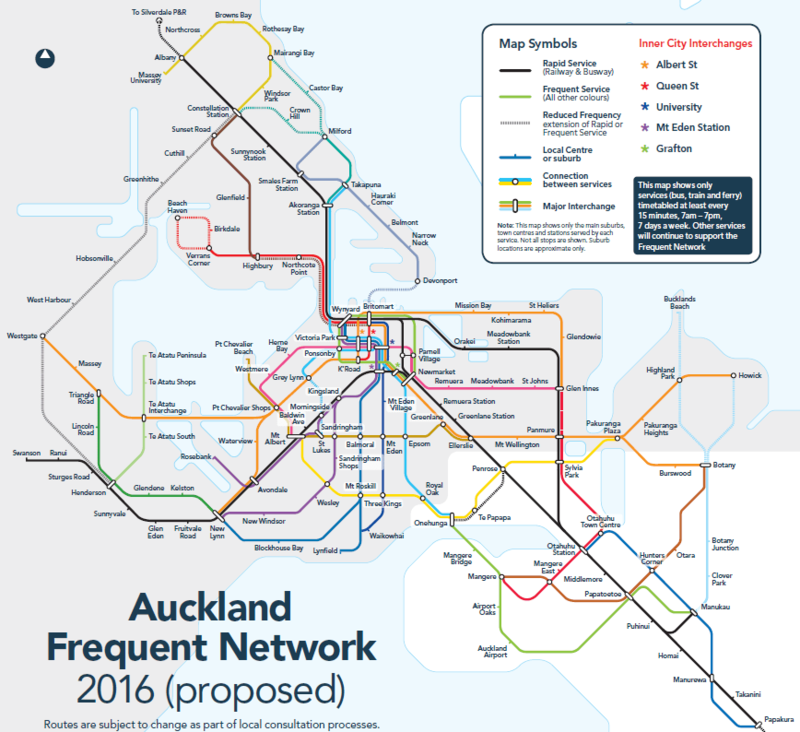 He argues that building apartment buildings on arterial roads – precisely where they will have the best access to frequent public transport services on Auckland’s New Network – is a bad idea because it will lead to increased congestion on the roads. That might be just as well because mindlessly boosting residential development on arterial roads promises simply to compound Auckland’s congestion problems. We know higher densities are associated with higher congestion. 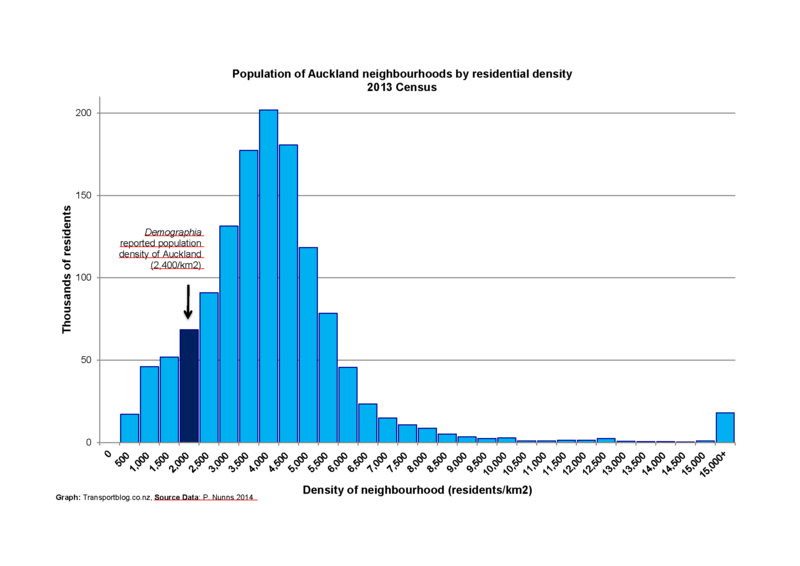 Auckland’s geography means it already performs poorly on this count. The Tom Tom Congestion Index confirms this. 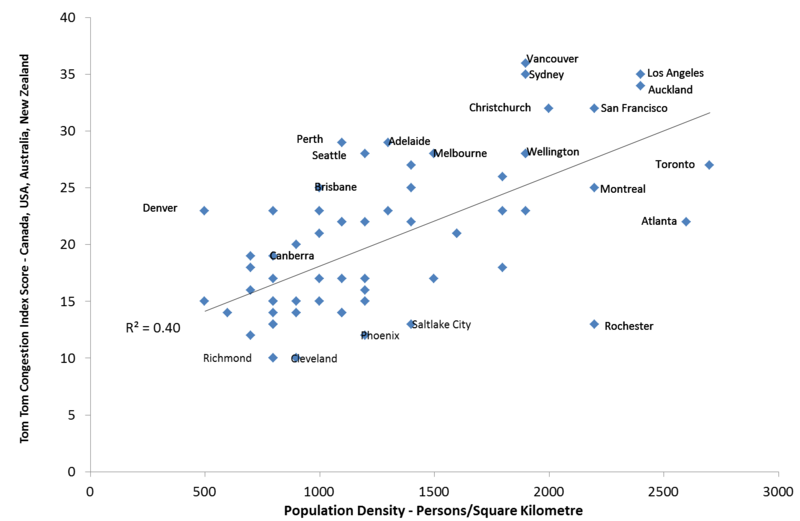 When the 2013 congestion index for 65 American and Australasian cities is plotted against population density (sourced from the Demographia website) Auckland sits among the worst performers – Vancouver, Sydney, Los Angeles, and San Francisco (Figure 2). This is not a serious piece of analysis – it is an insult to econometricians. McDermott makes three elementary errors in this short excerpt alone. It measures the difference in speed between free flow and congested periods. That means cities with lots of all day congestion there isn’t as much of a difference between peak and off peak times and therefore they get recorded as having less congestion. Second, McDermott omits important variables and makes inappropriate inferences about causality. While he observes a correlation between two variables, that’s hardly sufficient to prove that building apartments will increase congestion. The causality could very easily run the other way. For example, it could be the case that the presence of congestion creates an incentive for people to live closer to employment and amenity. If that’s the case, then McDermott’s preferred policy of banning apartment developments would make Aucklanders much worse off by preventing them from minimising their travel costs. As per capita delay went up, so did GDP per capita. 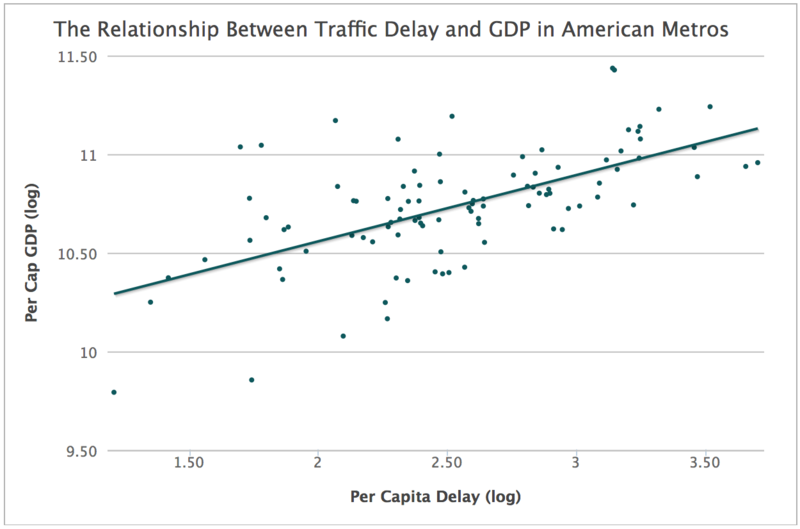 Every 10 percent increase in traffic delay per person was associated with a 3.4 percent increase in per capita GDP. For those interested in statistics, the relationship was significant at the 0.000 level, and the model had an R2 of 0.375. In layman’s terms, this was statistically-meaningful relationship. Such a finding seems counterintuitive on its surface. How could being stuck in traffic lead people to be more productive? The relationship is almost certainly not causal. Instead, regional GDP and traffic congestion are tied to a common moderating variable – the presence of a vibrant, economically-productive city. And as city economies grow, so too does the demand for travel. People travel for work and meetings, for shopping and recreation. They produce and demand goods and services, which further increases travel demand. And when the streets become congested and driving inconvenient, people move to more accessible areas, rebuild at higher densities, travel shorter distances, and shift travel modes. In light of these counterintuitive relationships, the simple two-variable OLS regression that McDermott is relying upon is almost certainly misleading. If you report on density/traffic without quoting Newman and Kenworthy you just haven’t done your academic homework.